"Excuse me Mr. Spaceperson but this is a private party, so why don't you just go on home." The above info came from Amelia, and was edited by yours truly (contact me). Krillin is this short little bald guy. He's usually the first guy to get killed because he's usually the one with the lowest power level. Nevertheless, he fights valiantly and is a great friend to Goku. His special attack is the Destructo Disc [Kienzen] even though practically every other character can do it. He just does it the most. Krillin is a neat little guy and one of my favorite characters. He's also one of the strongest humans on the planet! The above description came from Amelia, and was edited by yours truly (contact me). For a long time now, people have been questioning who in the Dragon Ball series is the "Strongest Human? ", so it's time we reached a mutual understanding. With that said, here is my choice of who the "Strongest Human" is, and the explanation that leads to this decision. My choice of the "Strongest Human" on Earth will have to be Krillin. There's a lot of qualities that make a fighter what they are, Tien has proven that in some of those qualities, he has Krillin beaten, however when it comes to certain areas like strength, Krillin would have to be my choice of being the strongest and here's why. First off , I'll explain the Power Levels that were claimed to have been written by the DB creator himself: Toriyama-sensei. The "Perfect File" books are reference guides to the series and often contain character and attack names and other clarifications which are not present in the manga or anime themselves. There are no current plans to release these books in the US and they are out of print even in Japan. Many fans however question how canon the actual books are. The books were not actually written by Akira Toriyama. The given books are often disregarded by some fans who find inconsistencies in them. One notable example is that Nappa's power level is stated to be 4,000 in the books, though this is never given in the manga along with assortment of other readings given. Both the manga and Dragon Ball Daizenshu: Story Guide state Goku's power level during the fight to be 8,000, which means he was twice Nappa's power level suggesting he should have had an easy time defeating him without using Kaiou-Ken. This is not true as Nappa manages to trade blows with Goku and after barely deflecting Nappa's strongest attack, comments that the fight will take forever without the use of Kaiou-ken, contradicting the stated information in the Daizenshu. These books contained the power levels that were included within the Power Level Charts, with this, I state that if this person or anyone else was referring to the Power level Charts at that time of this Editorial, their statement that I've quoted, would be incorrect. Next I'll explain the first Chapter of the DB series: Dragon Ball. And just so were clear on this, I'm using a mix of both Manga and Anime references from the series, so don't worry, any info that you find that you feel would contradict this Statement, I'll take time to prove its significance and if I miss one, just let me know. In Dragon Ball, before realizing the power of his true heritage, Goku and Krillin were pretty even in everything they accomplished together (if you exclude the times Krillin cheated, I know!) as Master Roshi's students, with Goku always being at least 1% over Krillin since he's a Saiyan (or simply just "different" because the existence of the Saiyans wasn't until later on). When Goku and Krillin entered the 2first World Tournament, both boys fought their disguised teacher Master Roshi and were actually able to hold their own against him, but were ultimately defeated in the end. Though they lost the tournament, Master Roshi had admitted his reason for defeating his students was because both Goku and Krillin made it to a level in their strength and skills that made them Advanced Fighters, but wanted them to become stronger, meaning that as long as Goku and Krillin continue to think someone out there is stronger than them, they'll work even harder to become stronger themselves. After the Tournament, Goku went on to search for his Grandfather's 4-Star Dragon Ball, while Krillin stayed with Master Roshi on his Island and continued his training (with Yamcha becoming Roshi's newest student sometime later on). Sometime after the defeat of the Red Ribbon Army, Goku then continued his training on his own in different parts of the world. In The 22nd World Tournament, The Semi-Finals, Tien took on the returning World Champ Jackie Chun and needless to say, their fight was undeniably the most intense evenly matched battle ever, as both fighters bared their all and neither one was showing any signs of quitting. The fight between Jackie and Tien however would end in a climatic stalemate, because from out of nowhere, Jackie unexpectedly jumped out of the ring eliminating himself, letting Tien win that round. Moving on to the finals, here's another Quote stating views on Tien's superiority: "At the 22nd Budokai, where he first appears, he actually defeats Goku to win the entire tournament!" I'm sure by the expression in that statement, this person was either implying that Tien was as strong as, or even stronger than Goku at one time, which either way isn't true! By my observance of Tien in the 22nd World Tournament, I would have to say that he was just as strong as Roshi, and if that was so, Tien couldn't be as strong as or stronger than Goku, because Goku at that time, was now at a level in his strength and skills that even surpassed his Old Master! Tien was clearly outmatched, because he wasn't even able to takedown Roshi and vice-versa, meaning both fighters were at a stalemate, plus Roshi quit the match anyway, so there's no actual guarantee that Tien was stronger than him. (Unlike Goku during DBZ, who did admit that Cell was the better fighter, therefore resulting into quitting the fight, just in case anyone wants to deny this fact.) Basically, out of Roshi or Tien, whoever fought Goku, would've lost regardless, the main reason for Tien lasting as long as he did in the Finals was because of Goku holding back the bulk of his true abilities which allowed Tien to gain an early advantage over him, as well as other factors. Krillin could've defeated Tien, because he came closer than anyone in that Tournament to defeating his Martial Arts buddy: Goku. (And understand that Goku himself was stronger than Tien back then!) Both boys battled each other in the semi-finals and much like the Jackie versus Tien bout, their battle was just as intense and just as even, for both boys were able to give each other something to work for. Then suddenly just as the fight began to escalate even further, Krillin once again managed to exploit his opponent's weakness and would try to use it to his advantage. By grabbing Goku's tail, Krillin would've had him instantly subdued and tossed out of the ring, ultimately winning the match and advancing to the finals, but unfortunately for Krillin, Goku trained his tail beyond it's old weakness and once again he had a 1-up over his Pal. Goku regained control, then proceeded to knock Krillin senseless with fast and ferocious attacks, resulting in his defeat and Goku moving on to the finals. In the finals when Goku and Tien faced off, Goku shown how Tien's Third Eye could be beaten, when he introduced a new technique that made "Phantom" images of himself. (I have problems remembering the full name of this move so that's why it's in quotations.) Tien's Third Eye can see the "Truth" (since it represents the eye of his mind), it can see what normal eyes can not. When Goku defeated Krillin, to everyone else it looked like it was done with one hit, but Tien's Third Eye actually revealed it to be several hits. The point here is that Tien's Third Eye can make an invisible physical object appear, if an object is physical, then that makes it possible to see, but if it's a physical object that happens to be moving at a remarkably fast pace, it then becomes impossible to see. Tien's Third Eye also comes in handy towards other "fake-off" moves like the "After Image" technique, by easily detecting the real image from the fakes, but what if Tien was to have an opponent that was even too fast for his Third Eye to follow, hence Goku's "Phantom" Technique. Goku was able to project images of himself that were after images, but in much more solid form, making them more visible for the eye to see and since these images can be seen by regular eyes, Tien's Third Eye couldn't discern it since it wasn't invisible or blurry. Since the fakes were physical enough to see, Tien's Third Eye believed the images to be real and thanks to the "Phantom" images, Tien's Third Eye can no longer help him as he was forced to wait for the copies to completely diminish for Goku to show himself. A situation took place sometime during the match when Master Tsurusennin instructed Chiaotzu to sneak attack Goku from within, with that said, Chiaotzu used his psychic powers to hit Goku, and every time this happened, Goku would be stopped dead in his tracks giving Tien the unfair opportunity to strike back. After Tien's protest against his Master, Goku had time to regain his bearings and was back on the attack, using his "Phantom" move again to make it appear he grew 6 extra arms to outmatch Tien's "Four Arms Technique." It was by this time around, Tien lost his upper hand and now that it became clear he couldn't put Goku away as easily as he thought, he went for the next best move: The Tri-Beam. Tien fired the attack, completely obliterating the Tournament Ring and would seem he took Goku with it since he was standing there at the time, however he escaped the Tri-Beam and was floating high within the air with the levitating Tien, where he then launched his final assault. Goku fired a Kamehameha faking-off Tien thinking that the blast was meant for him, but would actually use it to propel himself directly into Tien like a missile and rammed him with a HARD head-bunt right in the abdomen, knocking Tien totally unconscious. Both fighters began making their descent to the ground below, Goku had enough energy left to do one more Kamehameha, it was weak, but enough to push him further into the air making his descent slower than Tien's, meaning that Goku was going to win his first World Tournament! Unfortunately, the battle would not end this way, as Goku was hit by a truck causing him to hit the ground just moments before Tien did. Tien may have defeated Goku and won the 22nd World Martial Arts Tournament, but this doesn't make him superior to Goku or as strong as him, as he beat Goku by a stroke of luck and not by his own hands like he claimed he would. Plus, Tien was knocked unconscious, he awakened to realize he just won the Tournament, if anything, he thought he was going to lose too, I guess most people didn't want to see it that way, the only thing that was being focused on was that Tien beat Goku, instead of focusing on how this went about. As said, Krillin like Goku, could've beaten Tien that day, for 1 thing, it was Krillin who nearly defeated Goku and even equaled him pound-for-pound, until Goku got serious. The difference maker in Krillin's battle with Goku, was that Goku increased the power of both his speed as well as his strength to beat him, none of Goku's attacks at first was keeping Krillin down, so it was then Goku was forced into revealing the ferocity of his true strength! Tien was able to keep up with Goku's agility because of his Third Eye, but that was also rendered ineffective and like Krillin before him, Tien was at the mercy of Goku's superior speed, but unlike Krillin, Goku depended largely on his speed and wits rather than his strength to defeat Tien due to his enlightenment, so Goku was more into outsmarting him, not overpowering him! Without his Third Eye, I'd say that Tien was just as fast as Krillin was back then, so why do I keep saying that Krillin would've also won? Tien, during that time, was depending on his Third Eye majorly on helping him scope out his enemies for him. Being able to see Yamcha's Wolf Fang Blowing Wind coming the second time it was used, from before he was taken down by it, and even being able to see Goku's attacks that did in Krillin, the Third Eye of Tien would be considered an essential tool towards his victories in the 22nd Tournament. Unlike Goku however, Krillin didn't have to be faster than Tien to beat him, because in Krillin's case, throughout the Tournament Finals, he had developed a knack for finding his opponents' weaknesses and using it to his advantage. From finding Chiaotzu's weakness and using it to defeat him, to even catching Goku off his guard and managing to grab his tail, basically if Krillin were to have fought Tien in 22nd World Tournament, it would've only been a matter of time until he realized that Tien's biggest weakness lied within his biggest Trump Card: his Third Eye! Being the resourceful person Krillin has become, by following Goku's example of deception, Krillin would have claimed a victory over Tien, from where Krillin was lacking the speed that Goku had, he made up for it with his intelligence in battle. The Piccolo Daimaou Saga was the time Krillin met his untimely demise at the hands of Piccolo's son Tambourine, this is when Master Roshi explained Piccolo's Origin and how his Old Master Mutaito used the Mafuba Technique (Evil Containment Wave) that locked Piccolo away for many years. Tien soon started training to learn this "Technique" after the deaths of Roshi and Chiaotzu. This is where another mistake was made. True, after the 22nd World Tournament Tien started training again, but only to learn this technique. He didn't become stronger, otherwise he would've done better than what he did when he faced Piccolo Daimao. Which means that if Tien was really superior or equaled to Goku during Dragon Ball, he would've defeated Piccolo Daimao on his own. And as for Tien surviving against Piccolo's Son Drum from where Krillin was killed by Tambourine is concerned, doesn't count. This issue I brought up because some people claim that Tien surviving an attack from one of Piccolo's Spawn and Krillin's Death by Tambourine makes him weaker than Tien. Understand, Tambourine's Death Blow hit Krillin to the Head, from where Drum didn't "Death Blow" Tien period, but merely pummeled him. Not to mention Goku himself was overpowered by Tambourine at one time and would've died too if Tambourine wasn't already convinced that he'd killed him. Once again, this only proves that luck was on Tien's side as Drum's thrashing upon him was interrupted by Goku's appearance, other than that, he had as much chance of surviving as Goku and Krillin did, which was slim to none! (Especially Goku who just barely manages to cheat death more than once during this Saga!) For people who thought Goku couldn't beat Piccolo Daimao without Tien's help and even saying that he was an essential tool towards Goku's victory, as I quote this: "Tien remains the second strongest of the protagonists: being instrumental in Goku's victory against King Piccolo." Goku was quite capable of defeating Piccolo Daimao without any assistance. Thanks to the Altered Divine Water, he became strong enough to take care of himself, on top of that, almost anyone of the Protagonists (that were fighters of course) compared with Goku in those days, would be considered the second strongest. True, Tien was the second Strongest person in the fight against Piccolo Daimao, but it doesn't mean he's the second Strongest Protagonist. Goku was a resourceful little guy back then, so Tien's help wasn't necessary, as Goku even stated this fact himself, but hey, even still, if Goku had that kind of energy left to fight with Piccolo Daimao, he could've dodged his attack, meaning Tien coming to Goku's aid really made no difference! After Piccolo Daimao's defeat and the lives the fallen heroes were restored, everyone began their training for the 23rd World Tournament, while Goku trained on Kami's Lookout, Tien, Krillin, and Yamcha were training at Korin's Tower. The 23rd World Martial Arts Tournament came and Majunior made his presence known as he came to the contest for the accomplishment of killing Goku. In the semi-finals of the Tournament, Goku faced off with Tien in a rematch. To prove his position as the strongest human, this statement quotes that Tien gave: "Goku a truly amazing rematch in the second round of the tournament." In their opinion maybe, but not to some others, and what I mean by others, I'm talking about Majunior. Majunior watched Goku's fight with Tien and he was not very impressed by what he saw, because he initially thought of Goku to be much stronger than what he had displayed. Soon Tien began to show Goku how fast he's gotten (without the use of his Third Eye) and even learned a new move called the 12-Eyes Technique that knocked Goku out of the sky. This event made Majunior laugh to himself, even implying within in his own thoughts of how pathetic it was that Goku was on the verge of losing to someone that wasn't on his level, but then Goku had suddenly regained his bearings and caught everyone (but Majunior) by surprise as he effortlessly defeated Tien. Overall, if the fight against Tao was that simple (not to say it was that difficult), then Tien would've easily came out of that match unscathed, and since Krillin and Yamcha trained on Korin's Tower for the same three years time, they also could've defeated Tao, so just because Tien did fight him and they didn't, doesn't make him any stronger, as it was claimed in this quote: "in DB, he seemed to benefit more from training, constantly staying stronger than Krillin", that's far from being accurate. In the Quarter Finals of Krillin versus Majunior, Majunior believed Krillin to be just another weak fighter standing in the way of his eventful battle against Goku and that this fight would be easily won. However, as Majunior witnessed for himself, Krillin gave the overconfident and powerful demon a fight to remember. Though Krillin came out that battle short-handed, Majunior was left spellbound by Krillin's strength and was even speechless, Roshi credited Krillin for putting up a good fight against his powerful opponent, and even Goku was impressed with his best friend. Majunior came to the Tournament with the sole purpose of killing Goku, but after his fight with Krillin, he began to worry about there being other fighters like him coming up and possibly being even stronger, so with this in mind, Majunior has now made it his obligation to kill Goku along with the other fighters in the Tournament to eliminate his future competition. Majunior was pretty powerful back then, the only one that was actually on his level was Goku. However, what I'm saying is that neither Tien nor Krillin were on Majunior and Goku's level, yet Krillin managed to achieve what Tien couldn't, and that was putting fear in the Heart of Majunior! Majunior seeing Tien fight Goku, clearly wasn't impressed (especially seeing how easily he was done in by Goku), while his fight with Krillin on the other hand, left him a little worried, for Majunior to be as strong as he was for him to show fear of Krillin where he didn't show much interest in Tien, that's saying something! (And to prove this fact, go to www.myfavoritegames.com and look up the 23rd World Tournament.) Before moving on, I'd like to take this time to give a description about both characters. During DB, Krillin would be seen as the timid, wisecracking, sometimes trouble-making, and let's not leave out comedic character, where as Tien was always serious, focused, and determined. Look at the differences in their characters. Tien is a recluse who dedicated his entire life to training and is a serious warrior. Krillin is most often a practical joker and retired from fighting after the battle with Cell so he could settle down and start a family. 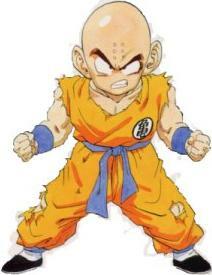 This would make Krillin look like the weaker fighter compared to Tien, but overtime with his rivalry gone friendship with Goku, his constant training on Roshi's Island (yes constant, Krillin has other outfits, but would usually be seen wearing his Martial Arts Gi), like Goku, Krillin became a dedicated Martial Artist with the goal of becoming the best. As far as being timid goes, Krillin before engaging in any fight is always afraid and mainly from what I see, is from out of anxiety (fear of the unknown). Krillin would usually be seen questioning himself saying things similar to: "Do I have the strength to beat this guy?" or "Maybe it was a bad idea to fight after all." Fear of the unknown is common even among the greatest of fighters, for example: Gohan as a child always doubted himself of being powerful, yet always had the strength to take on any opposition as long as he's fueled with the right motivation and even Piccolo was seen putting himself down when it came to the battle against the Androids saying things like: "I could've trained harder, I could've become stronger," yet we saw he did just fine. This lack of confidence happens all the time, so really you can't put Krillin down for that. It's actually a good thing Krillin constantly humbles himself like this when you think about it, it helps build a better character, meaning that no matter what amount of training he's under gone, he feels there's always room to improve. (Hence the lesson Roshi taught Goku and Krillin to do since day one.) Master Roshi seeing Krillin lose to Majunior, was still proud of the fact that Krillin was able to hold his own during the fight and more importantly had changed his persona, as Krillin shown how much better focus, respect, and discipline he has now than when he was younger. Even now on DBZ as Krillin's position was switched completely into "Comic Relief", just because he doesn't act accordingly to his title as the strongest, doesn't mean he isn't. As a matter of fact, it's been made obvious that you can't go by a person's characteristics alone to see who's the strongest, for instance, Goku is a fun-loving and carefree person, who's love for fighting, is matched by his love for his family, friends, and food! Then you have Vegeta, who, like Tien, started off as a recluse, constantly distancing himself from others and training all day to perfect himself into becoming the: "Unsurpassable Warrior", but as we see even by contrasting Goku's big heart to Vegeta's seriousness, who's still the strongest out of that deal! Improvement and humbleness were two factors that Tien didn't worry about in those days, because like I said he was a very determined person, meaning he was dedicated enough to the Martial Arts as it is. However, the problem with this is that Tien can sometimes, if not most of time, allow his determination to be the best fighter lead to an overconfident persona. In other words, there are times that he believes that the amount of training he's already acquired was enough to be superior against any fighter he competed against! An example of this overconfidence would be Tien's past battles with Goku, in the 22nd World Tournament when he believed he had Goku's fighting style all figured out and that he would be taken down with no problem. However, as we saw to be the result of that, Goku almost (well, basically he did) defeated Tien and would've won his first World Tournament. Then there was the 23rd World Tournament when Tien thought that his new found speed and Multi-Form Ability would've had Goku completely outmatched, but as we saw to be the result of that, Tien was still no where near as fast as Goku and as far as his Multi-Form Technique is concerned, though it's useful in some accounts, it has got to be the worst technique Tien has ever used against Goku. Multi-Form is a good technique when plotting a surprise attack, but battling against someone in a head on 1-on-1 battle using this technique was not the smartest move Tien could've ever made. Goku (as well as the other Saiyans later on in Dragon Ball Z) have a thing of trying their opponent's strength out before making the decision of fighting with their full power, meaning Goku would be calculating his opponent's fighting style and what is their true strength in battle. If Goku feels that his opposition is weak, he'll try to hold back, if it's a decent fighter he'll up the ante a bit, but if it's an opponent that's threatening to take him down, that's when Goku gets serious, Tien was strong, but he was nowhere near to being close to that 3rd option. Goku throughout his match with Tien had smile on his face (I'll explain the smile's importance sometime later) while Tien was baring his all, then there was a point in the battle when Goku stopped fighting to take the time to explain all of Tien's mistakes and one he pointed out in particular was his Multi-Form. When using this technique, Tien literally becomes 4 split versions of himself, meaning he's giving off 25% of his overall strength to the other halves and since this was the case, Tien was making himself weaker instead of stronger, ultimately making himself an easy target for Goku to pick off. Even without the Multi-Form Tien lost either way, because those doppelgängers all represented 100% of his total that did knock Goku off his feet, but with cheer and not strain, he got back up, so either split up or whole, Tien just couldn't put Goku away! Tien also has the tendency to imply to his opponents to don't get cocky and yet whenever he sees that he has the slightest upper hand over his competition, he let's his ego get the better of him, implying to his opponents that they don't stand a chance. If you take the time to notice, Tien at times, can show himself to be just like Vegeta, overconfident when having the upper hand, yet quick to anger and show frustration when they can't have it their way. The above description came from Jermaine Yelverton, and was edited by yours truly (contact me).